In the past decade, NOVA has become the epitome of clever sound systems. Musicians, installers, PA rental companies and many other users of our products have discovered NOVA around the globe increasingly for themselves. We put all our passion and enthusiasm for music in our products and our service. With good virtues and intentions we give every day the best for our customers. A perfect price / performance ratio and sound quality of the highest class are our goals. CRAAFT AUDIO GmbH is the roof of the brand NOVA© (NOVACOUSTIC©). The company offers loudspeakers and sound reinforcement systems, power amplifiers and digital speaker management systems. With more than 40 years experience our engineers develop high performance products for the MI market, cinema market and pro-audio market. Typical users are musicians, bands, installers, rental companies and churches. 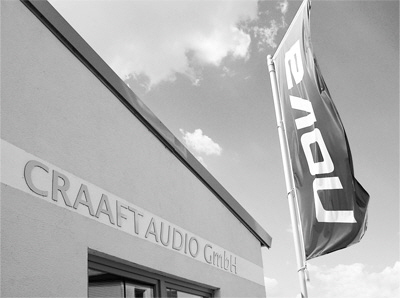 The headquarter of CRAAFT AUDIO GmbH is located in Pocking (Germany). The brand NOVA© (NOVACOUSTIC©) stands for innovation, modern technologies and outstanding ratio of price and performance. Our production departments in Germany use high performance components, such as from BMS©, B&C©, BEYMA©, 18-SOUND©, FAITAL© as well as own components. In 2007 the company invested in a new factory. Thousands of products can be stored and shipped from this facility into 72 countries all over the world. Due to innoative technologies and products the future looks brilliant for CRAAFT AUDIO GmbH and NOVA© (NOVACOUSTIC©). The 2014 newly opened NOVA-LAB development laboratory includes a big measurement hall, which has ideal properties for any kind of acoustic measurements. The technical equipment includes high-profile measurement systems, modern software for measurement and simulation, high-grade microphonic and robotics. ► High reliability and quality of our products. ► Latest technologies in development and production enable manufacturing and processing at top level. ► Quality control starts with the development of new products. ► “Thermal stability”, “circuit security” and acoustic performance are considered well while developing and passing to processing. ► Factory for electronic devices fulfills RoHS, WEEE, CCC, CE and ISO9001 approvals. Of course, we are there for you by phone, email or in person. A factory visit at our factory in Pocking (Germany) is possible by appointment.